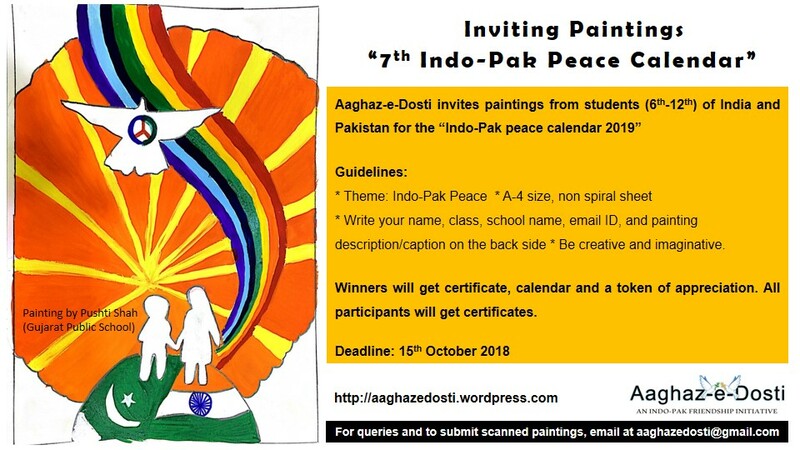 Aaghaz-e-Dosti, an Indo-Pak friendship initiative of Mission Bhartiyam (India) and Hum Sab Aik Hain (Pakistan), launches an Indo-Pak Peace calendar every year. This calendar is a collection of selected paintings of school students from Pakistan and India and is launched along with a seminar in several cities in both countries. It also carries messages from renowned personalities working on the issue from both the countries. The importance of the calendar is that it is a collection of shared dreams and hopes for friendship which we will be reminded of everyday. This will be the seventh calendar. We have received great response for this calendar in the last 6 years. We have received paintings from students and schools in different cities of India and Pakistan and from non-resident Indians and Pakistanis. The calendars have been launched in Delhi, Dehradun, Chandigarh, Kolkata, Mumbai, Panipat and Surat in India, in Islamabad, Karachi, Lahore, Peshawar and Toba Tek Singh in Pakistan, and and in Kyrgyz Republic. We invite paintings from students of India and Pakistan. Students can participate individually or through school. Indian and Pakistani students studying in other countries are also invited. Twelve paintings, six from each country, will be selected. Students of class VI to XII are invited to take part. Students whose paintings will be selected will get certificate, calendar, and a token of appreciation. All participating students and schools will get certificates. Names of participating schools will appear on the calendar. As a preventive measure, we request you to kindly inform the students to take care of the design of the maps and flags of the two countries. The paintings which will not follow the above-mentioned guidelines will not be considered.